The Susan Murphy Milano Show: How Much Do We Know About an Abuser? 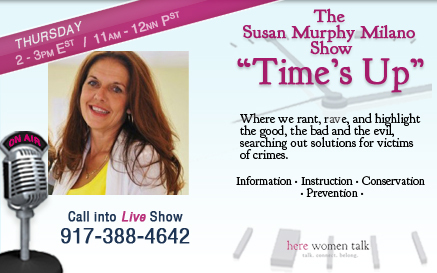 The Susan Murphy Milano Show, Time’s Up! once again welcomes Sandra L. Brown, M.A., CEO of The Institute for Relational Harm Reduction and Public Pathology Education,along with Dr. David Clark, the CEO and Clinical Director of Atlanta Intervention Network. The discussion today with these two professionals surrounds the issue of who is providing batterer intervention treatment, anger management, how much perpetrator history/mental health/addiction are part of the overall picture, and victim risk. Sandra Brown not only speaks nationwide on the subject of pathology and how it relates to abusers and their victims, she also holds scheduled retreats for victims who have come out of a pathological love relationship and are seeking support. Sandra also holds trainings for therapists from around the world who are continuing their education in the realm of pathology. Dr. Clark has a doctorate in pastoral counseling, is a nationally certified (MAC) addiction counselor and provides training and supervision for individuals seeking to be certified in family violence intervention programs and addiction treatment. He has been a minister in the local church, a chaplain, and for most of the last twenty years has provided intervention classes for domestic violence and alcohol/drug abuse (ASAM Levels I, and II.1). He is certified as a criminal justice professional (IC&RC) and performs evaluations for the U.S. Department of Transportation (SAP).